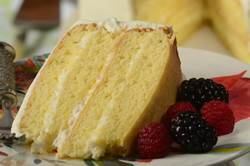 Simple Vanilla Cake: Preheat your oven to 350 degrees F (180 degrees C) with the oven rack in the center of the oven. Butter, or spray with a non-stick vegetable spray, two 9 x 2 inch (23 x 5 cm) cake pans. Then line the bottoms of the pans with parchment paper. In a bowl, sift or whisk the flour with the baking powder and salt. In a small bowl rub the lemon zest into the sugar. In the bowl of your electric mixer, fitted with the paddle attachment, (or with a hand mixer) beat the sugar (mixed with the lemon zest), eggs, and vanilla extract until smooth and creamy (about 1 minute). Then, with the mixer on low speed, alternately add the flour mixture (in three additions) with the milk and oil (in two additions), beginning and ending with the flour mixture. Evenly divide the batter between the two prepared pans, smoothing the tops with the back of a spoon or an offset spatula. Bake about 25 to 30 minutes or until a toothpick inserted into the center of the cake comes out clean and the cake springs back when pressed lightly in center. Place the cakes on a wire rack to cool, in their pans, for about 10 minutes. Then invert the cakes onto a wire rack. Remove the parchment paper and re-invert cakes so that tops are right side up. Cool completely before frosting. Soaking Syrup: In a small saucepan bring the water and sugar to a boil, stirring to dissolve the sugar. Let boil for about one minute. Remove from heat and let cool before adding the alcohol. The soaking syrup can be made ahead and stored in the refrigerator for a couple of weeks. Cream Cheese Frosting: In the bowl of your electric mixer, or with a hand mixer, beat the cream cheese and mascarpone cheese until smooth. Add the vanilla and confectioners sugar and beat until light and airy (a couple of minutes). In a separate bowl whip the heavy whipping cream to soft peaks. Gradually fold the whipped cream into the cream cheese frosting until smooth. Assemble: Cut the two cake layers in half horizontally (so you will have four layers of cake). Place one cake layer (top of the cake facing down) on your serving plate and lightly brush with the soaking syrup. Spread with a thin layer of frosting. Next, lightly brush the cut side of the next layer with the soaking syrup. Place the cake layer (cut side facing down) on top of the frosting, and spread with a thin layer of frosting. Repeat the process with the next two cake layers. Then cover the entire cake with the remaining frosting. The cake can be covered and stored in the refrigerator for 3-4 days.